Eddie Hearn hinted Tuesday night that Anthony Joshua still will fight June 1 at Madison Square Garden. Whether Jarrell Miller will remain his opponent apparently has not yet been determined. Hearn, Joshua’s promoter, also confirmed the adverse finding from the urine sample Miller provided the Voluntary Anti-Doping Association on March 20. VADA has been contracted to administer the performance-enhancing drug testing for their 12-round heavyweight title fight scheduled for six weeks from Saturday night in New York. ESPN.com was the first to report Tuesday night that Miller tested positive for GW 501516, also known as endurobol, a banned substance that can burn off excess fat, speed up recovery while training and significantly enhance endurance. Hearn issued a statement through his Twitter account Tuesday night, which read: We have been informed by VADA that there has been an adverse finding in Jarrell Miller’s sample collected March 20th, 2019. We are working with all relevant parties and will update with more details soon. AJ’s preparation continues for June 1st at MSG. Dmitriy Salita, Miller’s co-promoter, also issued a statement to BoxingScene.com late Tuesday night. If Miller (23-0-1, 20 KOs) is removed from their fight, any potential replacement for the Brooklyn native would have roughly a month-and-a-half to prepare to challenge Joshua. If failing this test keeps Miller from fighting for Joshua’s IBF, IBO, WBA and WBO titles, it’ll also cost Miller a $6.5 million payday, by far the biggest purse of his career. The 29-year-old Joshua (22-0, 21 KOs), a mainstream superstar in his native England, reportedly will be paid in excess of $30 million for his debut in the United States. The trash-talking Miller has accused Joshua of using PEDs, both before and after their fight was made. It was Miller, however, who failed a PED test nearly five years ago, when he also was a kickboxer. The California State Athletic Commission suspended Miller for nine months and fined him $2,500 because he tested positive in June 2014 for methylhexaneamine, a dietary supplement used for weight loss and improving athletic performance, among other things. 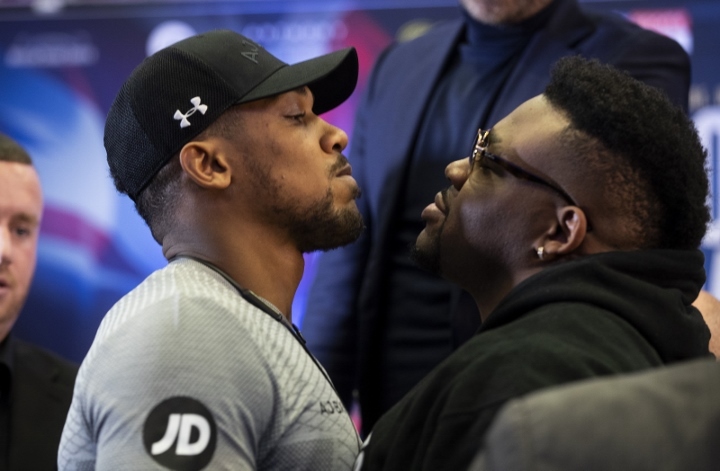 Miller, 30, explained during the press tour nearly two months ago to promote his fight against Joshua that he failed that test because he used a product that he wasn’t aware was on the list of banned substances.